In Sunday’s The Washington Post, columnist Marc Fisher once again highlights the need for attention to the condition of the National Mall. He writes about a new organization, Trust for the National Mall, and its leader Chip Akridge who aims to raise $500 million to help the National Park Service restore the Mall. 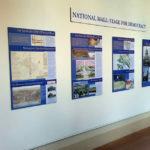 He also mentions the National Mall Conservancy (http://www.nationalmallconservancy.org), a citizens organization created in 2007 by the National Coalition to Save Our Mall to start taking on programs and projects to improve visitors’ experience of the Mall–local residents as well as tourists. The two groups with complementary goals–Trust helping NPS with maintenance and infrastructure, Conservancy giving the public a voice in improving the Mall’s role as lively urban park–could lead to some meaningful, exciting changes in coming years. Chip Akridge, one of Washington’s most prolific builders, spends his morning jog checking in on his downtown office buildings and ranging across the Mall to visit Mr. Jefferson. Running in the early light, he’s often swept up in a patriotic reverie, taking in the dome, the obelisk, the Wall — the iconic shapes that symbolize democratic liberty. “I generally stop, salute and thank God I was born in this country,” Akridge says. But these days, the developer is sending a different message about the place he runs through each morning. The Mall, Akridge has sadly concluded, “is a disgrace,” a neglected hodgepodge of denuded grounds, oversize tents and port-a-potties deposited almost at random. As the buds start to pop and the Mall comes alive with kickball and Frisbee players, it’s easy to overlook what a mess we’ve made of the nation’s showcase landscape. But Akridge’s new Trust for the National Mall and a group called the National Mall Conservancy are trying to force Congress and the private sector to end decades of dysfunction and create the Mall’s first new vision in a century. An opportunity to tell visitors the story of this country has been lost, and it’s easy to see why. There’s the inability of Congress to say no to interest groups that want their memorial or museum on the Mall; the National Park Service’s failure to enforce reasonable restrictions on business, religious and advocacy groups that build huge encampments on the Mall’s central corridor; and the inadequate funding and planning that leave tourists searching for information, restrooms, food and water. The worst of the security hysteria that turned the Mall into a symbol of fear and bureaucratic ineptitude after 9/11 is finally over. Some less-offensive security measures, like the low walls around the Washington Monument, are replacing the blizzard of Jersey barriers and fences that made the Mall so ugly for too long. But port-a-potties still dot the landscape, and the Mall’s 25 million annual visitors must make do with just 100 toilets, 54 rangers and three places to buy water. The Jefferson Memorial is sinking into the Potomac River so quickly that large portions of the path around it are submerged. Akridge says the Mall needs $350 million for deferred maintenance plus more for a long list of improvements — a total of $500 million, an amount no one believes the federal government will cough up. So the Trust is launching a campaign to persuade Americans to do for the Mall what private sources did for New York City’s Central Park, where a $500 million fund drive achieved a remarkable about-face for a jewel that had become an urban nightmare. This is not an easy fundraising challenge. Not a single voter lives on the Mall’s 700 acres. And it isn’t exactly a place where companies and billionaires will be encouraged to attach their names to create the Taco Bell World War II Memorial or the Bill Gates Reflecting Pool. Meanwhile, the Mall Conservancy, under the direction of longtime advocate Judy Scott Feldman, is focusing on expanding the Mall’s boundaries to create space for future memorials and museums, adding parking to the existing area and emboldening Congress to stand tall against such foolhardy, anti-intellectual projects as the visitors center that is supposed to “explain” the Vietnam Wall. Both Akridge and Feldman say the Park Service initially resisted offers of help, but they now seem encouraged that the Mall’s managers are open to change. The Park Service is writing a new plan for the Mall, and although its initial concept was criticized by some who feared having demonstrations restricted, the Mall’s deputy superintendent, Steve Lorenzetti, says the addition of a gathering space for protesters at the foot of the Capitol will not make it any harder for demonstrators to gain access to traditional protest spots. Still, the level of suspicion among Mall users is matched only by the tangle of bureaucracies that makes any improvement difficult. No fewer than 17 agencies have some say over what happens on the Mall. Even with such a daunting process, Akridge believes the Mall can be preserved for political expression and equipped with restored structures, audio tours, interactive maps, costumed historic interpreters, food service and, yes, restrooms. Now that’s optimism — which, of course, is one of the Mall’s most basic messages.